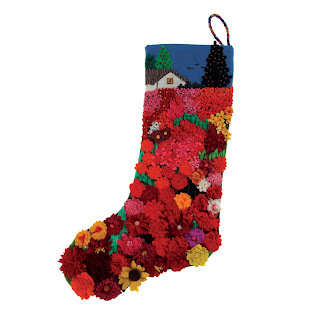 I am planning on producing stockings for my whole family, that’s 18 people, of whom 6 are under 18. And – being me – I have GRAND plans. I was trying to find ideas of with what to fill the stockings then, and… I think it’s really difficult – this is not a Finnish tradition. I love the little dolls or animals sticking out of the stocking… I think it’s “necessary” – to give the stocking the “right look”. Then I’d like to have some greenery, a spruce spray or something like that. And a little Yule ornament, to create the “right look”. It would also be nice to start a tradition of Yule ornaments. It would also be nice to have something funny. A true Xian does not celebrate Xmas. I celebrate Yule. The birthday of Light. If you want to call the Light “Jesus” or “Christ”, you do that. It doesn’t matter to me. I see Mother Goddess in every nativity scene with the baby Sun God, with the golden rays surrounding His head, just as Sun God has always been depicted. For me this is so natural, self evident and obvious, that I don’t even mind most of the Xmas carols. Ever wondered why Joseph has so little if any role in the nativity scene? Ever wondered why people cannot even agree on whether Joseph was old or young? He just doesn’t have any significance, it’s all about the Mother and the Child. So Yule is the festivity of Sun God. Sun God’s colors are red, gold, white, yellow and orange. All the citrus fruits are dedicated to Sun God, which means that bringing oranges (which are especially “dangerous”, being round and orange) in to your home, you are building an altar to Sun God. Do I mind? Of course not. Stars, as we all know, are suns as well (at least most of them). So decorating with stars is just to remind of the real reason of the season; birth of Sun God. Stars also have other associations to me. Goddess Astraea, the Starry One, is the Goddess of peace and justice. Many other Pagan Deities use the starry skies in the Midwinter time to spread the message of co-operation, communication, listening – peace and silence. People have used the stars as illustrations and memory aid to stories, and stories bring us together, makes us listen to other people instead of our own voice, fears and prejudices – stories teach us the important things in world, ethics, morals, values, attitudes. So also the color of night sky isn’t “safe”. And if anyone wonders about the TRUE meaning of Xmas; love, peace, joy and justice, I can tell you that these are not especially Xian values. Scandinavia has called in Yule Peace several thousand years. Yule tide, Midwinter Blot, was the time of coming together and dealing with juridical and governmental matters, so the peace was very important. After dealing with the matters the king ordered a huge party filled with warmth, good food, joy and merriment. (But the peace had to be kept – every kind of disturbance of the peace was punished extra hard at this time). So even before we knew anything about the “new God”, we celebrated Yule as the tide of love, peace, joy and justice. And there’s absolutely nothing wrong with these universal values. If you wish to call the Xian, do so, but just remember that these values existed long before Xianity. Candles, lanterns and all the other places you lit a fire, all these are sympathethic magic. We are lighting candles to remind us of the light, and reminding Goddess of Her promise to bring the sun back after winter. “Xmas tree” is a Pagan tradition as well. So calling it a Xmas tree is… er… well, let’s say that it doesn’t change the significance. Do I mind? Not at all. LOL The Xians spread Pagan evangelium all over the world, why would I mind? Evergreen trees have always been the Goddess’ promise of that the world isn’t dead, there’s hope and life is just sleeping. Sun will return, the snow will melt, spring will come and the nature will be green once again. So – when I see the wintergreens and winter blossoming flowers, I am reminded of this promise. Do I mind? Not at all. Please, use a lot of greens, especially holly and ivy. The mistletoe is especially Pagan. Kissing under the mistletoe is praying to Goddess of love. And not using the wintergreens isn’t helping at all – because the color green is enough. Santa Claus is originally Pagan God. Hello, reindeers? Gifts have been a usual way of celebrating the New Year all over the world. It has usually been new clothes and some money. The Romans and the Germans celebrated Midwinter as their New Year, so the habit of giving gifts at “Xmas” time is very Pagan indeed. Some Xians will say that myrrha and frankincense are pure Xian symbols, but they are not. Of course not. The Romans and Greek offered these things and other good smelling insences to Gods – so, decorate your home with scented candles and you invite the Pagan Gods to your home with the fume. Cinnamon, frankincense, what ever. The same goes with everything about Xmas. A true Xian does not celebrate Xmas. There’s nothing Xian in Xmas. I have to say that calling it Xmas – with the “crossing out Jesus” meaning some Xians seem to have to it – sounds like the only honest name.